Chrome River is a modern, easy-to-use, refreshing alternative for global expense reports. Global expense reports are quite complex behind the scenes. There are currencies, languages, and local tax jurisdictions. But our goal is to make global expense reports easy and intuitive for business travelers so that they can concentrate on their business goals: successful meetings, dynamic conferences, working with different divisions. Business travelers demand a solution that works where they are, when they need it, and Chrome River delivers it on their smartphone, their tablet, or their laptop – all with the same user experience. Buttons tap and slide with a fingertip touch, receipts are recorded with the camera, VAT is calculated and reclaimed, currencies converted in a snap. AP managers and travel managers want to make every penny, pound, and yuan count. So they are looking for per diem functionality that makes sense no matter how many borders are crossed. They also want to unite all their colleagues under one expense policy and want the expense report process to help communicate those policies in every language their colleagues speak. Chrome River has all the international functionality built right in and displays compliance warnings and reminders throughout the trip pre-approval process. And CFOs want an expense report that is built to last – that grows and evolves with their company. One that’s agnostic to integrations with financial systems, with travel management companies, with online booking tools, with corporate card programs. One that understands privacy and security regulations around the globe and can shift with legislation changes. But let’s face it – doesn’t everyone in your organization want to do business with a trusted partner…not a brutish vendor? Expense reports are a commodity. But customer service and customer success is the true differentiator when it comes to global expense management. 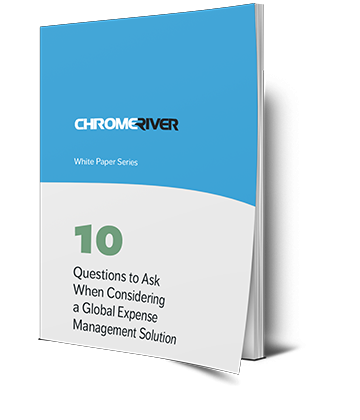 Learn more about Chrome River for your global organization and see why over 1.5 million users around the world can’t wait to do their expense reports and why CFOs now have a tool to help them track, manage and reduce spend.